Michigan Works! facility in Detroit. President Donald Trump talked about unemployment rates during his recent State of the Union address. “Something I’m very proud of: African American unemployment stands at the lowest rate ever recorded,” the president said to applause. “I think I have to question the statistics that he’s actually looking at,” he said when I talked to him at a job fair in northwest Detroit. I asked Frankin: Do you think it’s different in Detroit than the rest of the nation? “Oh, of course. I have friends in other communities and they don’t talk about the unemployment at the rate that we talk about it in Detroit,” Franklin replied. Charles Ballard is an economist at Michigan State University. Let’s look at President Trump’s claim that African-American unemployment is the lowest ever. I asked Charles Ballard to show me the numbers. He’s an economist at Michigan State University. “According to the statistics from the Bureau of Labor Statistics, that’s true. In December, the black unemployment rate was 6.8% – that’s national – and that is the all-time low,” Ballard said. He noted that since the president made that statement, January’s rate was released, and it jumped nearly one percentage point, to 7.7% black unemployment. That all-time low was fleeting. But, Ballard says those December unemployment figures showed something else. “The gap between the white (rate) and black (rate) was 3.1 percentage points. That’s also an all-time low,” Ballard said. He says that might be the more important statistic from December’s national numbers. Ballard says narrowing that gap between the unemployment rates between whites and blacks is progress. Detroit is an 80% African-American city. The unemployment numbers are higher than the rest of the state and the nation. In December the rate was 8.7% unemployed. Michigan as a whole was at 4.7%. 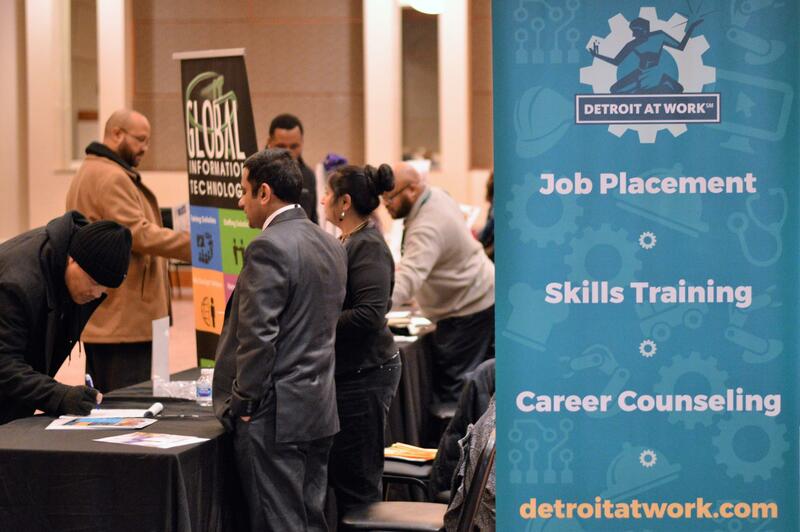 A job fair held at the Northwest Detroit Activities Center. Back at that job fair held at the Northwest Activities Center, there were mixed reports about job prospects. “I’m finding it much easier to find work now. 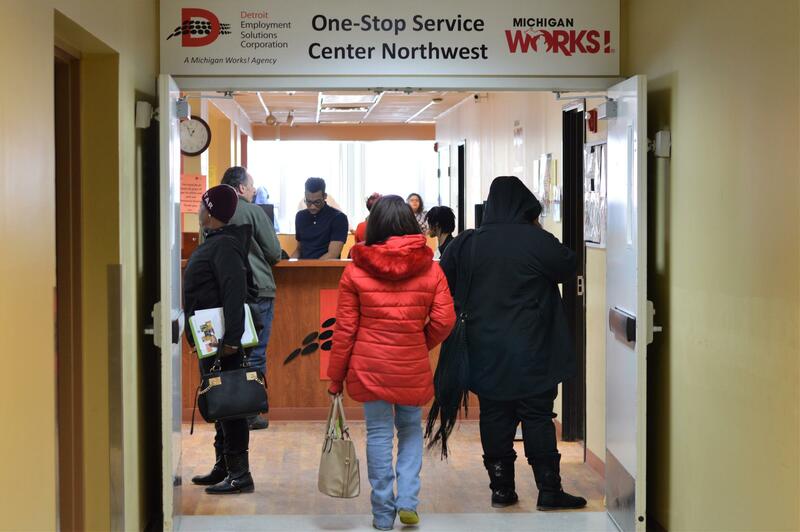 And I can’t say it’s because of Trump’s administration, but because of the resources that has been presented in the Detroit city area, it’s much easier to find work,” said Michael Jones. Both were looking for a job. They would be included in that unemployment number we hear every month. But, there are others who are not: people who’ve given up looking for work. And people who have a part-time job, but want to be working full-time. Those two groups are included in another unemployment rate, an expanded unemployment rate. When you include those people, generally speaking, you can double the standard U.S. or state unemployment rate. Charles Ballard says that’s important to keep in mind when you look at Detroit. “We don’t have an expanded unemployment rate for Detroit. But, my sense is that it’s probably at least twice as high as the official rate. If the official rate currently – it’s been eight or nine in some recent months, that might mean that the true full rate of unemployment or underemployment might be high teens, it might be in the twenties,” he explained. And that’s during good economic times. Right around 20% unemployed or underemployed is close to as good as it gets! Ballard does think unemployment in Detroit will go a little lower in the near future, but not as low as the state or national rates. He says that’s some time away. “I think we can hope for a lot better for the city of Detroit twenty years from now,” Ballard said. Why 20 years? Ballard hopes the graduation rates continue to rise, that there will be an eventual recognition that K-12 schools must be improved in Detroit. If not, the state will pay a huge price for allowing its largest city to continue to struggle.